The unofficial first half of the National Hockey League season concludes tonight with 30 of 31 teams in action before the all-star break begins tomorrow. Even though all NHL teams just enjoyed their bye weeks earlier this month, several squads must be happy to be getting another extended break. Both the Devils and Panthers are dealing with injuries to their top two goaltenders, and New Jersey’s also banged up at forward with both Taylor Hall and Marcus Johansson out. The Rangers could use a breather as well after going through a hellish schedule over the past couple of weeks, set to play their 8th game in 13 days tonight. 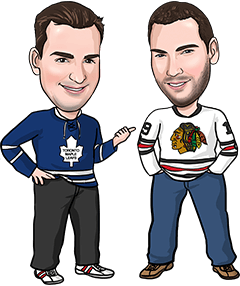 We hit our one play last night on the Leafs/Blackhawks Under 6 after going 1-3 on Tuesday. Definitely looking forward to a few days off from hockey handicapping, but it’d obviously be nice to go into the break with a winning night tonight. Reasons to bet Minnesota: The Wild is 6-1-2 in its last 9 games and has won 3 straight meetings with the Penguins. Reasons to bet Pittsburgh: The Penguins are 16-7-1 at home and have won 6 of their last 8 overall. Minnesota has scored just 6 goals in its last 5 road games. Reasons to bet Columbus: The Blue Jackets have won 5 straight meetings with the Coyotes, and 3 of their last 4 visits to Arizona. The Coyotes have scored 2 regulation time goals or less in 7 of their last 9 games. Reasons to bet Arizona: The Coyotes are about as hot as they ever get, earning points in 7 of their last 8 games (3-1-4). Columbus has lost 8 of its last 10 road games. Reasons to bet New York: The Islanders have earned points in 5 of their last 7 games (4-2-1). Reasons to bet Vegas: The Golden Knights are 19-2-2 at home while New York has lost 8 of 11 on the road. Vegas has allowed just 6 regulation time goals in its last 4 at home. Reasons to bet New York: The Rangers are coming off a 6-3 loss Tuesday at Anaheim and have won 19 of their last 26 games following a loss of 3+ goals. San Jose has allowed 4+ goals in 5 of its last 9 games. Reasons to bet San Jose: The Sharks are 9-3-3 in their last 15 games. New York has lost 6 of its last 8 games and is playing for the 8th time in 13 days. Reasons to bet Nashville: The Predators are 5-0-2 in their last 7 games and are 12-7-4 on the road. New Jersey has 1 regulation time win in its last 11 and is down to third-string goaltender Ken Appleby who will be making his first NHL start. Reasons to bet New Jersey: The Devils are 13-7-3 at home this year. Nashville has allowed 3+ goals in 5 of its last 6 games on the road. Reasons to bet Tampa: The Lightning is coming off a come-from-behind 4-3 OT win Tuesday in Nashville. Philadelphia has scored just 9 goals in its last 5 games. Reasons to bet Philadelphia: The Flyers have won 5 straight at home and 8 of their last 9 overall. Tampa is playing its 4th road game in 6 days and has allowed 3+ goals in 5 of its last 6. Reasons to bet Washington: The Capitals have been off since Sunday and should be focused to break out of a 1-2-2 funk in their last 5. Florida has allowed 4+ goals in 6 of its last 8 games and is down to third-string goaltender Harri Sateri. Reasons to bet Florida: The Panthers look to bounce back from a 6-1 loss Tuesday in Dallas. Washington has 3 regulation time wins in its last 15 games. Reasons to bet Carolina: The Hurricanes have won their last 6 games against opponents with losing records. Montreal has given up 4+ goals in 4 of its last 6 games. Reasons to bet Montreal: The Canadiens have won 7 of their last 8 home games versus Carolina. The Hurricanes are playing their 4th game in 6 days, all in different cities. Reasons to bet Chicago: The Blackhawks seek revenge for a 4-0 loss at home to Detroit earlier this month. The Red Wings have lost 5 of 7 and have just 10 wins in 26 home games (10-9-7). Reasons to bet Detroit: The Red Wings have won 5 of their last 7 home games against the Blackhawks. Chicago has scored just 8 goals in its last 6 games and is playing for the second straight night. Reasons to bet Boston: The Bruins are 13-0-4 in their last 17 games, allowing 2 goals or less in 14 of those 17. Ottawa has given up 4+ goals in 5 of its last 6 games at home. Reasons to bet Ottawa: The Senators have earned points in 14 of 24 home games (9-10-5) and look to avenge a 5-0 loss at home to the Bruins Dec. 30. Boston is playing without Marchand, who was suspended yesterday. Reasons to bet Colorado: The Avalanche had won 10 straight games before Tuesday’s 4-2 loss in Montreal. St. Louis has 2 regulation time wins in its last 7 games. Reasons to bet St. Louis: The Blues have held opponents to 1 goal or less in 3 of their last 4 games and should get a boost offensively from the return of Jaden Schwartz. Colorado has been outshot in 7 of its last 9 games, including by a 40-22 margin Tuesday. Reasons to bet Toronto: The Leafs are 14-10-3 on the road and have earned points in 7 of their last 9 games overall (4-2-3). Dallas has lost 5 of the last 6 meetings. Reasons to bet Dallas: The Stars have won their last two games by a combined score of 13-2. Toronto has 1 regulation time win in its last 12 games and is playing for the second straight night. Reasons to bet Calgary: The Flames have earned points in 10 straight games (7-0-3) and are 13-5-4 on the road. Edmonton has scored 1 regulation time goal or less in 7 of its last 10 games. Reasons to bet Edmonton: The Oilers need to show some pride after getting humiliated 5-0 on home ice Tuesday by the Sabres. Calgary is playing for the second straight night and has lost 6 straight meetings. Reasons to bet Buffalo: The Sabres have won 2 straight following Saturday’s 7-1 loss at home to Dallas. Vancouver is 8-12-3 at home. Reasons to bet Vancouver: The Canucks have won 3 of 5, including a 6-2 rout of the Kings Tuesday. Buffalo has lost the last 4 meetings and 7 of the last 9. Reasons to bet Winnipeg: The Jets have won 3 straight games and 6 of their last 8. Anaheim has given up 3+ goals in 5 of its last 7 games. Reasons to bet Anaheim: The Ducks have won 12 of the last 15 meetings. Winnipeg is playing its 4th game in 6 days, all in different cities.